I wanted to get something for my children's daycare teachers as a group, for Christmas. So I started looking into edible fruit bouquets, cookie bouqets, food baskets etc (they love food). Then I came across a candy bar cake. I had never heard of it before. There were a few places that had them, but they were like $50! Plus more if you're shipping to hot weather places. So I started looking around on how to make one myself. All in all it cost about $20, but I also had tons of candy left over and some other supplies to make more. It's hard to tell in the pic, but there are 3 tiers like a wedding cake. I used paper mache nesting boxes (round ones with 6", 5" 4" diameters). JoAnn's also had bigger ones if you want a really big one. I also saw that you can use styrofoam as your base if you find 2-3 pieces that fit together nicely. I think my environmental side was kicking in so I opted for paper. I've also heard that you can use round cookie tins or a cake pan as the base. 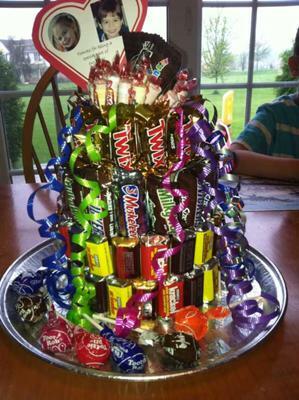 I think this would be great for a Christmas gift because you can then put candy or gifts in the tin as a "surprise" when they finish the candy or they can keep the cake pan as a gift. bottom of the top box to have it trickle down. I saw pics online of ones that had candy on the top lid so you could probably do it either way depending on the size and amount of your candy. Then after the base was together, I lined up the candy in the order I wanted to do it. You have to play around a lot and measure which candy fits where. Some pics online use the regular size candy bars which looked cute too. I found it helpful to measure the circumference and then measure out the candy bars. Then you just use a tiny spot of glue and glue them on. That's it! I found a nice platter at the party store for $1 so I put it on there with some suckers as decoration. I saw some pics where they wrapped paper around the candy so it was more uniform, but that seemed like it would take forever. I wanted to put a card on it so originally I was thinking I'd put square Reeses on top and stick the note to the top one, but then I found these cupcake sticks that hold place cards (kinda like the ones that stick in a flower bouquet, but short). It worked perfect. So there you go. The teachers got a big kick out of it. There are tons of different things you can do- use holiday colored candy, use just one kind of candy on each tier, use square boxes, etc. I think I'm gonna make one for our neighborhood potluck (since I don't cook). I'll just have to use non-chocolate candy in case it's hot). I love it! It is lovely and very well put together. Wow Tina! This looks absolutely great. Thank you for sharing this very fun gift idea. Cute. Fun idea for something different. Thanx.